1933. A long time ago, but to me it is as if it were yesterday. Never forgotten, are the waking moments on those cold, dark and drizzly, winter mornings to hear the anguished, muffled moan of the foghorn from Mumbles Head. Stretching skinny, eight year old legs down the bed, toes would touch the lukewarm earthenware hot water bottle and I would yawn. I basked in the snugness of the moment knowing that soon, I would have to face the inevitable and get up, to suffer the freezing cold of my bedroom, to don ice cold garments and, shivering, scurry to the bathroom. But, just a few moments more! Then! Drifting up from the seafront, the accelerating ‘le-lull-la-lull….le-lull-la-lull’ of the Mumbles Train reached me, as it pulled out of Oystermouth Station, bound for the Pier. All adding to that delicious feeling of the warmth and security I was so privileged to enjoy in my feather bed. Those lovely Mumbles noises, alas, gone forever! Saturday mornings were special, having the added waking delight of no school. In front of me lie a weekend to use as I please (within reason), two days of self indulgence! The social life of a Mumbles boy was a busy one, so much to do, so much choice! Football up the rec’ with the boys? Play in the street? Go up the Woods? Up the Castle Field? Down the Pier? Funny, but looking back, I cannot remember any arguments or decisions being made, whatever we did just seemed to happen spontaneously, and off we’d go and do it. The Tivoli or the Regent? On a winter’s Saturday afternoon, there was only one place to be- no question about it! --Sitting with two million other Mumbles kids in the thruppennies, of the Cinema! But, even then, there was an agony of indecision!- Which cinema? The Tivoli or the Regent? Now this did entail argument and heated discussion- unless of course, someone like Johnny Weismuller was swinging through the trees as Tarzan! In the middle of this hedonistic whirl, would be Johnnies’ fish and chips for dinner! That gold encrusted cutlet of hake with blisteringly hot chips- all cooked in cholesterol-rich animal fat- devoured happily in our ignorance! Few people today, if they could sit down now to the like of that three penn’orth of fish and chips would give a damn. One mouthful of such exquisite cuisine would banish all precaution- it was irresistible! Food worth dying young for! Such reverie would be interrupted by the heavy tread of my father on the landing, as he approached my bed room door. He flung it open (my father never opened doors he always flung them open). He switched the light on. (Occasionally Dad slid into a time warp, back serving with the Manchesters, in Ypres). He was off to work. In the ‘thirties, Saturday morning was an accepted part of the working week although there was the concession of starting the day at 0900 hours instead of the customary 0630hrs. Although brusque, he was at heart a very affectionate man, a quick hug and kiss and he was gone, to catch the Mumbles Train to Swansea. Reluctantly, I shoved back the bedclothes to face the near zero temperature of the room, trying not to touch the icy lino between the mats. Shivering, I pulled on clothes discarded in haste the night before, and within minutes, after the briefest of ablutions, I was sitting in the kitchen eating my breakfast by a glowing coal fire with kettle steaming on the hob. Yes, it was Saturday! Off down the road, short muffler round neck, knitted gloves (from Aunty Gladys) to keep extremities warm. At first, the sharp wind cut around my bare knees- but, soon forgotten after breaking into a run. Rat-tat-tat on Number 4 Gloucester Place, pick up best friend Jackie Timothy and off to Steve Davies’ shop in Chapel Steet. (Nothing, healthwise, was sacred in Mumbles). “Yes, thank you, Steve, I’ll tell him you asked”. We put our tuppences on the counter and picked up our pristine new Tuppenny books – for me, “ the Skipper” and for Jackie, “the Adventure” (to be swapped later in the day). As it was Saturday, we spent a penny on 2ozs of sweets and with mouths full of toasted torpedoes and Pontefract cakes, we chewed away, slowly wending our way back to Gloucester Place, browsing through the contents of our new reading matter. Jack and I were privileged. Not everyone in Mumbles in those days could readily find tuppence to squander on a bit of cheap reading matter. These were hard times and there was so little to spare for anything that wasn’t an essential. Tuppenny books certainly came into that category. However, few were deprived of the joy of reading these books, because of an old Mumbles tradition. This dated back to the days prior to World War 1, always taking place on a Saturday morning in the cold winter months. It all happened in Gloucester Place, outside Mary Taylor’s sweetshop on the corner of John Street, an ideal site because of its central location. Shortly after nine o’ clock, the streets around this junction would fill with noisy, agitated children. They had made their way from all over Mumbles, clutching handfuls of old Tuppennies. Small ever-changing groups would excitedly mill around, calling to each other. It was Saturday Morning Tuppenny Swapping! They spilled around the corner of The Victoria Inn into Westbourne Place and overflowed up into John Street, scores of kids bartering and exchanging. Voices were raised, high pitched protests and laughter bounced of the walls, blending into the happiest of sounds! “Orlright, then !” … and a bargain would be struck! The choice of Tuppennies in the thirties was mind boggling. Amongst the most popular were the Wizard, Skipper, Adventure and Rover, whose ranks were joined by newcomer, “Hotspur”, in August 1933. This latter publication, like the very much older, “Magnet” and “Gem”, concentrated on public school yarns. To this day, I cannot understand why stories about boarding school life should have had such a tremendous appeal to ordinary working class children such as ourselves. The social gap between that way of life and ours was of astronomic proportion! There was variety on offer. The “Bullseye” catered for the more exotic tastes of those who loved tales of the occult, offering favourites such as,-‘the Withered Hand’, ‘the Haunted House’ etc. Just looking at the blue cover with its eerie illustration sent delightful shivers down ones spine. “Champion”, “Modern Boy”, “Triumph” and “Boy’s Own” appealed to the slightly older lad and encouraged practical crafts, for example ‘…how to build a canoe from a clothes hanger and your mother’s discarded knickers’, ‘how to make a six valve wireless set from two milk bottles, a clothesline and a butcher’s hook’’. I never met anyone who successfully completed one of these projects. I only knew of one who ever started. Most adults were contemptuous about these publications dismissing them as being rubbish but, here and there, an enlightened few, actually approved of them. There was that lovely chap, Raymond Bradshaw who was a teacher in the Board School. Now he postulated that it was better to read such as this, than nothing at all. Here was a stepping stone from the world of picture comics, to the written word in more serious works. Bear in mind that Mumbles had no public lending library until 1936, meaning that the likes of the Tuppenny was all that was available to read anyway! My father agreed most heartily with Mr. Bradshaw. When he was a boy of my age, he had read the Magnet and Gem, avidly. He made two points which also applied to the more modern Tuppennies. Firstly, without having it chucked into ones face, there was a strong moral code, skilfully written in. It was a simple code of good triumphing over evil. Secondly, the quality of the writing was first class, especially in the Magnet and Gem, which was written by public school scholar, Martin Clifford (aka Frank Phillips). Like all my contemporaries, there came a time when I felt the need to move on and read something more challenging and rewarding. I was eleven years of age when, the Public Library first opened its doors in Dunns Lane. With guidance from congenial librarian, Victor Morgan, I was introduced to the world of Robert Louis Stevenson, Arthur Conan Doyle, Dickens and so many others.. With an expansive wave of the hand, he indicated the loaded shelves of the library and told me that access to everything there was mine, for the asking. A treasury! Opening any cover would let me escape into another world. Without doubt, the Tuppenny Book had paved the way for me to this Alladin’s Cave, a debt I shall never forget. And what joy, I had experienced on the way! Hours and hours of enthralling reading, providing endless fuel for a young and active mind. No matter how fantastic the plot, how bizarre the characters, my young mind had assimilated it all. “Clicky Ba turn in my hand, master!- it is time to fight!”. Between them they subdued the entire Afghan rebel force. (and all that without any air cover). On Wednesdays, ‘The Rover’ introduced me to “the Black Sapper”, he was a gentleman clad in a black skin tight rubber suit with only his eyes uncovered. He operated an incredible gleaming steel torpedo like machine, each end of which had spiral cutters that could cut though any sub terrain- even the hardest of rocks. He would pop up in the most unexpected places in pursuit and frustration of villains. The Adventure, every Saturday, related the heinous activities of the sinister named ‘Zorro the Slink’ . He was a most unpleasant gentleman, not only in name, but also in appearance and behaviour. Hidden by a dense pea soup fog of his own making, he would descend upon his victims and rob them. Even the Bank of England was not immune to his method of attack. Zorro would throw his secret formulated bomb into the target area, only he had the means of seeing through the fog and long before it had dispersed he was on his way with the loot. Eventually he met a sticky end, when scientists invented a counter neutralising gas. Today he would end up as Chancellor of the Exchequer. 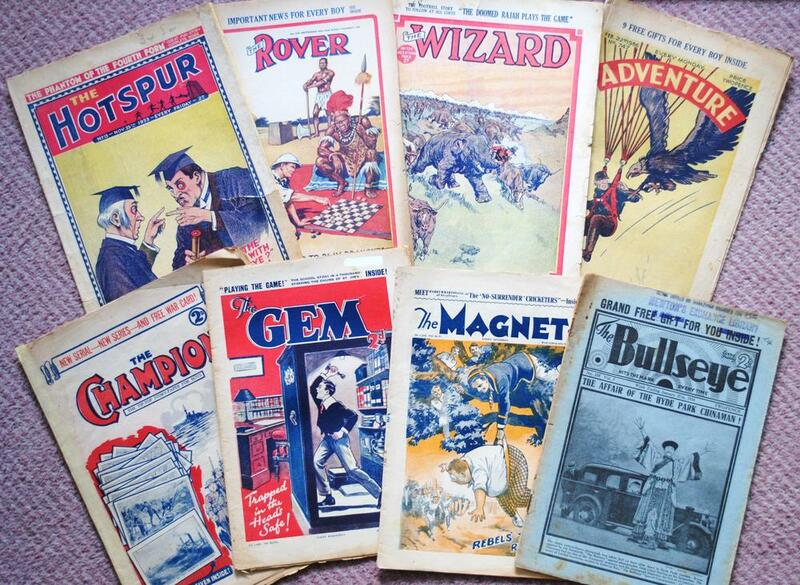 For decades, cowboys, cricketers, footballers, soldiers, airmen, sailors, performed their superhuman deeds in the pages of the Tuppenny but top of the list in popularity, by a long chalk, were the schoolboy heroes of the Magnet, Gem and Hotspur. Cads and rotters were few. The typical public schoolboy was presented as being a fine living chap, ‘who played the game’, was ‘a creature of honour’ and yet found time to get into the most fearful of scrapes. The exploits of Greyfriars’, Harry Wharton and his Famous Five’ in the Magnet, vied in popularity with St. Jim’s, ‘Tom Merry and the Terrible Three’. Billy Bunter the Fat Owl of the Remove, still lives, a hundred years on after his creation, as a popular character on Television and stage. Written superbly, by Martin Clifford, these boys lived for us and gripped the imagination. So real were the images created of these ancient schools that boys were known to cycle around the leafy byways of Surrey in search of the historic buildings..
To this day, I treasure original copies of these weeklies and whenever reading them, I marvel at the quality of writing and pen sketch illustration. No printer’s errors. Excellent plots delivered with no bad language or innuendo. A clear code of behaviour- virtue triumphing over evil. Not a bad message to get across to a young lad! In World War 2, the US Forces did not arrive alone in the UK. With them came Spam and the American comic. The less said about the former, the better. The latter brought in a new dimension of humour, spectacular illustration. and ‘balloon speech’. All far easier than reading the written word. The writing was on the wall for the dear old Tuppenny. After the war, radio broadcasting increased enormously and along came Television, the demise of the Tuppenny was at hand! How much easier to sit back and just watch and listen instead of the boring necessity of having to read words and conjure up visions of ones own making. Computer games hammered in the last nails. So, they’ve all gone! The Tuppenny is no more. No more swaps on Saturday mornings! I console myself with the fantasy that in a Valhalla somewhere for Tuppenny book heroes, the Wolf of Kabul and loyal Chung are still battling with Afghan cads. And, that in a celestial Greyfriars, Harry Wharton and his Famous Five are cooking crumpets and kippers in their studies, that Billy Bunter is still waiting for his postal order and cadging money for the Tuck Shop. And, that over in St. Jims, Tom Merry and his Terrible Three, are in their ‘whites at the nets’, or sculling on the river. As a busy lad, one of my joys at the end of the day was to come wearily home and pick up my Magnet. Before going to bed, I loved to curl up in an armchair and be transported from my small, humble world to join the select company of pupils in the shaded cloisters of a revered public school. For a short while, I would be one of them, dressed in short black jacket, striped trousers and Eton collar. I would have ‘whites’, a rowing shell, a study and a ‘basher’. I did ‘prep’, I visited the school tuck shop. For an hour or two, I would be one of them. To authors Frank Phillips (aka Martin Clifford), Gunby Hadath, and their worthy like, the very least I can say is “Thank you!”. You wielded your pens with a magic touch and brought so much joy to my childhood! Advertisers were quick to spot cheap and ready access to the younger market. The inside covers of the 8th issue of the Gem, dated April 4th1908, is packed with adverts. “The Mead Cycle Co of Liverpool”, offered ‘Coventry Cycles’ @ £3.10s.0d. carriage paid. “Rudge-Whitworth of Coventry”. Britain’s best Bicycle £3.15s.6d, or 7s. monthly. “ Electric Pocket Lamp”. Pain Bros. of Hastings. Superior quality. Price 1s.0d. No need for matches! You simply touch the Knob to produce a brilliant light. Superior refill batteries 7d each. By mid 1930s, volume, and variety, of advertising had grown enormously. “Whoopee Cushion”. “ ..when sat upon gives forth noises that can be better imagined than described..” Price 1s.0d. Postage 2d. “Magic Nose Flute”. “..A unique and novel musical instrument played with nose and mouth combined. Any one can play it. Not recommended to be shared”. Price 1s. “Midget Bible”. “Smallest bible in the world. Size of a postage stamp. 224 pages of Wonderfully clear print.” Price 1s.0d. Postage 2d..
“Itching Powder” 3d. a box. “Sneezing powder” 3d a box. “Seebackroscope” 9d. “Blackface Soap” 6d “Stink bombs” 3d a box. Ellisdon and Son cornered the postal market for the supply of anything designed to make life hell for adults. However, here in Swansea, “Dirty” Blacks had a superb joke shop at the lower end of Union Street. Here was a comprehensive range of all those tricks and devices that rivalled Ellisdon’s in evil ingenuity. It was a schoolboy’s Mecca. To see the extent of the philatelic advertising in the thirties showed the enormous popularity of this hobby amongst schoolboys. In Issue 169 of the Hotspur, eleven different firms advertise stamps for sale or, invitations “for approvals”. “Stuttering. New remarkable certain cure. Free booklet. “BE TALLER!” Inches put you miles ahead! “Increased my height to 6ft 3ins” Thousands gratified clients since 1907. T.M. Ross Height Specialist, Scarborough. Nothing seemed to be beyond the powers of these advertising firms. In The Gem, Issue No. 1.425, of June 8th1935. “BLUSHING” A proved home treatment that quickly removes all embarrassment and permanently cures blushing and flushing of neck. Enclose stamp. “HAVE YOU A RED NOSE?” Send a stamp and you will learn how to rid yourself of it. Even in those days, we had our fair share of charlatans!